All these explanations are plausible, yet to my understanding they don’t get to the core. Contemplating on populism and the phenomenon of Trump-like candidates my hypothesis is that systemically these candidates are a solution to a state of being, which I’d describe as a feeling of separateness. Let me explain by sharing the systems diagram I drew a few weeks ago, during the international Club of Rome meeting, and which I discussed with quite a few people. In this diagram you see two loops: one upper loop which is the short-term, quick-fix answer to the problem in the middle, the feeling of separateness. A populist candidate does everything to make you feel: ‘I’m with you!’ ‘I love people from Wisconsin!’ ‘I dig people from the Mid-West’. The sentence that is added to ‘I’m with you’ is: ‘I’m not with them’. The whole conference audience feels the energy of the actor, playing Trump. He does well, making you feel like he’s with you and connects with you. The Hillary imitator doesn’t get the audience swept up quite in the same way. She warns against this crazy man, but she does not make you feel she’s with you. The populist candidate makes people feel as if they’re no longer alone. Someone is taking care of them. The feeling of separateness diminishes, in the short term. In the longer term, things turn out quite differently. This is shown in loops connecting with the top loop: the loops that show the additional consequences of the populist candidate in office. 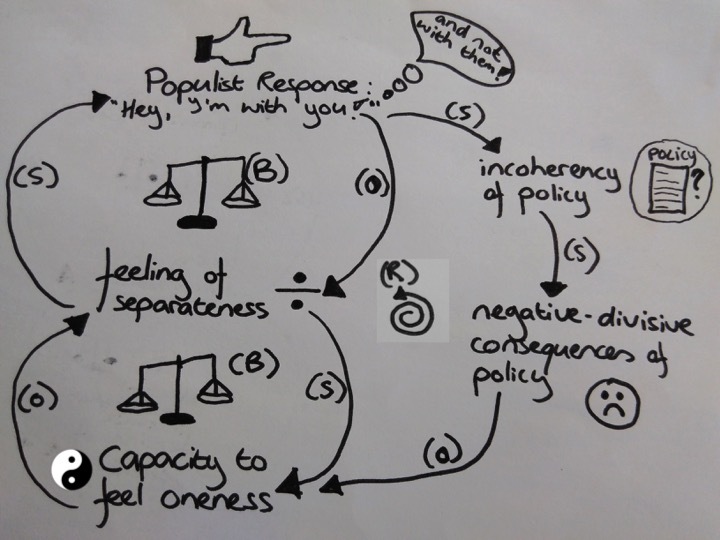 One of the loops shows that in order to ‘be with everybody’ a populist politician in power needs a lot of different measures to be able to prove that he or she is indeed with everybody. Consequently, the degree of incoherency of policy augments radically. And the damage that is done due to this incoherent policy also becomes much larger, creating more divisiveness. All this, makes it more and more unlikely that we can focus on strengthening the lower loop; a more fundamental response to our feeling of separateness, namely, the increase of our capacity to feel oneness. Now this is a typical systems archetype of ‘shifting the burden’. The story of ‘shifting the burden’ tells of a short term, quick-fix dynamic, which makes it more and more difficult to enhance the fundamental solution, which is always the systems self-generative capacity. In this case: the systems capacity to feel and experience ‘oneness’. Nice story, but I don’t yet get it: what does this feeling of separateness consist of? And what’s the story behind our capacity to feel oneness? I’ve worked with the theories of Otto Scharmer and peers (Theory-U) for a while now, and became more and more sensitive to what Theory-U describes as the three divides. 3) The Spiritual-Cultural divide – between our self (ego) and Self (greatest potential/ our essence). The Ecological Divide. We are depleting and degrading our natural resources on a massive scale, using up more nonrenewable precious resources every year. Although we have only one planet earth, we leave an ecological footprint of 1.5 planets; that is, we are currently using 50% more resources than our planet can regenerate to meet our current consumption needs. As a consequence, one third of our agricultural land has disappeared over the past 40 years. Rapidly falling water tables are taking us on a path toward food riots. Food prices are expected to double by 2030. The Social Divide. Two and a half billion people on our planet subsist on less than $2 per day. Although there have been many successful attempts to lift people out of poverty, this number, 2.5 billion, has not changed much over the past several decades. In addition we see an increasing polarization in society in which the top 1 percent has a greater collective worth than the entire bottom 90 percent. The Spiritual-cultural Divide. While the ecological divide is based on a disconnect between self and nature, and the social divide on a disconnect between self and other, the spiritual divide reflects a disconnect between self and Self—that is, between my current “self” and the emerging future “Self” that represents my greatest potential. This divide is manifest in rapidly growing figures on burnout and depression, which represent the growing gap between our actions and who we really are. According to the World Health Organization (WHO), in 2000 more than twice as many people died from suicide as died in wars. Populists have a symptomatic solution – what’s the fundamental solution? There are many options to intervene in such an obvious ‘shifting the burden’ dynamic. I’m going to highlight a few. 1) Let’s try to define what the overarching goal or vision is. In this case – can we agree that the goal of politics is to make decisions that serve the whole in the best way possible, in a way that does justice to all different elements that the whole consists of? If we would agree to that, then we might think about politics differently. Which candidate best serves the whole and stimulates our acknowledgment and respect of all elements that make up the whole? 2) Let’s try to understand what mental models perpetuate reliance on the quick-fix – in this case; mental models such as ‘it’s either me or them’, ‘the world’s a jungle and I just need to survive’, ‘the strongest will survive and the populist is the strongest’, ‘but also; this man’s extremely rich, and therefore he must do something good’. We need to work on understanding these mental models, especially with children. Where do they come from? And how can we introduce new propelling narratives? 3) Let’s see how the intensity of the quick fix can be reduced. In this case I can imagine that it would help if many people with other views than the populist view, would actively connect with populist candidates. Can we truly connect to the human Trump and as such reduce the intensity of the quick fix he represents? Can we massively go on empathy walks with Trump or Wilders supporters, to understand what they’re scared about, what they dream about? What is it they care about deeply? What is it they aspire for? The longer and more open we listen, the more another person will feel inclined to open up to you. Like Blues Musician Daryl Davis shows us. 4) Let’s define how more attention and resources can be directed to the fundamental issue and building internal capacity to the system – in this case: how can we enhance our society’s capacity to feel oneness? Can we find the injured parts of us that judge people of other religions, races, social statuses; the parts of us that are averse to individuals because our governments are at war with one another; the parts of us that feel entitled because we are more fortunate than others or richer; the parts of us that believe, and this is truly heartbreaking, that the Divine loves us more? I’d be quite happy if Dutch children at school, reflecting on the election of Trump, would be asked how different parts of them ‘are like Trump?’ I get the feeling that the conversation would be different, from what one might expect after such an election. Furthermore, what would help enormously to enhance our feeling of oneness, is when we’d create many, many more opportunities where people can personally experience oneness. Those of us who’ve ever experienced feelings of ‘oneness’ with nature – moments where we felt an integral part of all that was around us, remember these moments vividly. Such experiences have a profound effect on the way we behave and the choices we make in life. Those of us who’ve ever experienced feelings of ‘oneness’ with another human being, preferably someone very different from ourselves, remember these moments vividly. Such experiences too have a profound effect on the way we behave and the choices we make in life. And those of us who’ve experienced feelings of ‘oneness’ with their own deeper, essential self, remember these moments vividly. Also those experiences have a profound effect on the way we behave and the choices we make in life. One of the initiatives that I’m very keen on further exploring is the initiative of John Liu by Commonland to work on large scale ecosystem restoration, with a great diversity of people, who reconnect with nature, with each other, and with themselves, while working a few weeks a year in state-of-the-art self-sufficient eco-camps. These camps promise to allow for the emergence of a feeling of oneness and togetherness, while at the same time inviting us to bring in our own uniqueness to help these projects succeed. Another initiative that seems to support oneness (of self and Self) is the integration of meditation practices in public schools. The amount of schools that is integrating meditation practices in school life, is increasing, which is hopeful. And the results seem very promising. If all public school children would get the opportunity to connect with themselves once or twice a day through meditation, they would become calmer and will find it easier to collaborate and connect with others. What I see occurring on a neighborhood level is that more and more festivals and gatherings occur where whole neighborhoods are invited to work on the future of their neighborhood. I truly believe, though I don’t have the figures to back this up, that the amount of large scale participation processes is increasing. Think of David van Reybroeck’s G1000, and all sorts of other initiatives based on principles of deep democracy. What all these initiatives have in common is that they stimulate a feeling of oneness (between self & other). The Social lab that I’m working on to allow for the North Sea to be developed as a source of renewable energy, is also supporting feelings of oneness. We work with many different stakeholders and use tools and instruments that invite participants to connect with their deeper selves, with others, quite different from themselves and with the North Sea as a natural area. Though we just started, the first results are promising. A representative of the fisheries shared with all other lab participants that from one meeting to the other, he felt much more understood, and could see himself working constructively in the lab towards a better future for the fisheries, while wind at sea parks would also be developed. What large or smaller scale practices do you see, that can help us shift the attention and resources to the fundamental issue underlying the rise of populism – restoring our feeling of oneness? Please share your thoughts!